Cape Town - Black-controlled listed group Afrocentric Investment Corporation [JSE:ACT] (AfroCentric) and Sanlam [JSE:SLM] have reached agreements for the issue to Sanlam of a 28.7% interest in AfroCentric's wholly-owned subsidiary Afrocentric Healthcare Assets. This will result in Sanlam holding an effective 27% in Medscheme. The transaction is subject to certain suspensive conditions being fulfilled or waived. With Sanlam's extensive local and global distribution network and suite of financial products, together with the medical administration capabilities and membership base under management of Afrocentric, the investment by Sanlam will establish a platform for the joint pursuit and expansion of the parties' traditional activities as part of an expanded administration and managed healthcare business. CEO of Afrocentric Dewald Dempers said Sanlam's adept understanding of the retail financial products environment, together with the significant support Sanlam brings as AfroCentric's financial services partner, will enable Afrocentric to advance its current healthcare acquisition strategy and provide the opportunity to address the imbalances within the healthcare industry”. Sanlam CEO Johan van Zyl said this is a good investment opportunity for Sanlam as Medscheme has the necessary scale and management expertise to bring a medical aid solution to our clients. Following the subscription, AfroCentric will have significant cash for further expansion and be substantially debt-free. 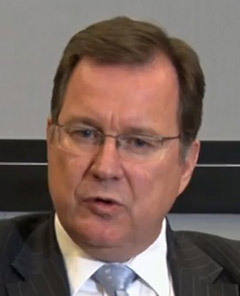 Sanlam CEO Johan van Zyl.